After witnessing the potential of MOSKIT first hand during Operation Desert Storm in 1991, the US Marine Corps tested the system in 1992 before carrying out further testing under the Foreign Comparative Testing programme. The first production order was placed on Metalite in 1997 and since then sufficient numbers of MOSKITs and SALKITs have been supplied to support 14 MOSLS – minimum operating strip lighting systems. A MOSLS system is comprised of 2 MOSKIT trailers and 3 SALKIT trailers and is air transportable in one C-130 aircraft. The principal of MOSLS is to support both fixed and rotary wing operations at expeditionary airfields. A single MOSLS system can be used to allow dual approach of a single runway as well as marking taxiways and parking areas. US Marine Corps MOSLS systems were first deployed operationally in 2001 during Operation Enduring Freedom. 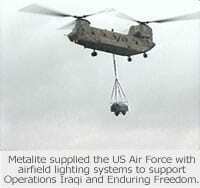 Since then they have been used extensively during Operation Iraqi Freedom in the support of forward and rear expeditionary airfields.